There is a new trend that has been appearing in the iGaming world, it has been immensely successful, but the majority of the industry doesn’t seem to have noticed yet. Online Casinos like Casino Heroes, Kaboo, and Ikibu, are flipping the script on how casino sites work, moving on from just supplying a platform to play games on, and instead opting to become games themselves, with missions to be completed by playing casino games, and rewards to be won if you do. It wouldn’t take much more than one hand to count the number of such sites that exist, which is strange, because you’d think more people would be getting in on the act after seeing how well the three sites mentioned above have done. Not everyone’s failed to notice the trend though, as proven by the arrival of Fantasino in 2017, a fantasy-themed casino (obviously) that follows the path walked by those few sites before it. At Fantasino, you play games to win missions and find hidden treasures to complete quests, wo you’re always playing one big game while you’re playing lots of other ones. Obviously, Fantasino will still have to be a good online casino in order to be successful, but this is an excellent start that immediately causes this casino site to stand out amongst the sea of competitors that exist in the iGaming industry. The execution of such a complex and immersive design concept has to be very, very good and Fantasino does not disappoint, with a stunning, mainly blue design that brings a cute and cartoony vibe with it. That vibe changes sharply when you visit the Fantasy World section of the site, with a bolder, brighter, and more visually striking design involving a lava filled mountainside and various sections for you to explore as you complete the various quests that are available. There are several characters and storylines to ensure that the game stays interesting, and Fantasino has navigation that is as good as you will find at any other online casino site, better than most. This is a good sign, as it would have been easy for Fantasino to get caught up in the concept, and forget to present a top-quality online casino as well, but there is no such problem here. Attention to detail is clearly of the utmost importance with Fantasino, and that really pays off when you look around this great looking and easy to use site. 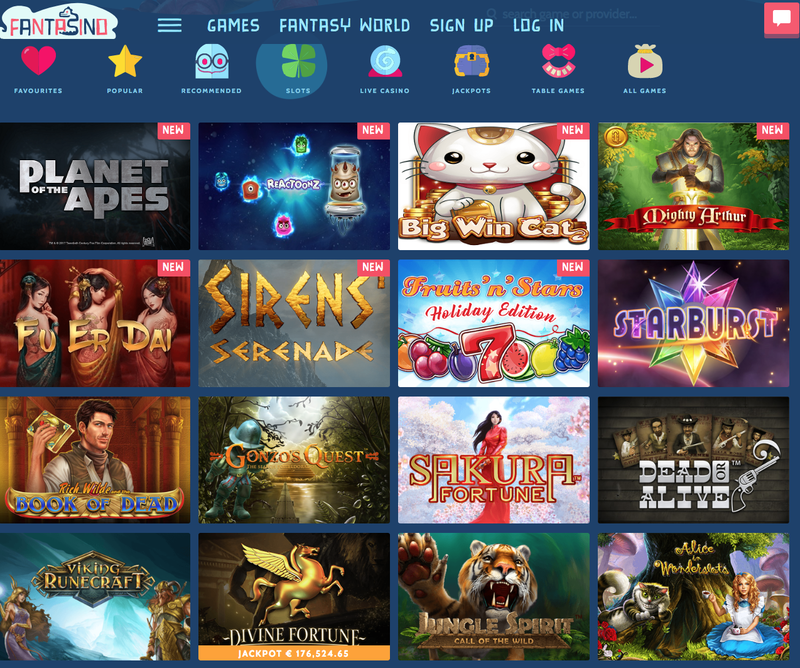 Despite the site itself offering a lot of gameplay, Fantasino has not sacrificed on the amount of choice it offers players, with a Herculean list of software developers behind the titles that are available at the site, a list that includes 1X2 Network, Authentic Gaming, Betgames TV, BG, Endorphina, EveryMatrix, Evolution, Felt, Genii, Habanero Systems B.V., IGT, Join Games, Leander Games, LuckyStreak, MrSlotty, MultiSlot, NetEnt, NextGen Gaming, NYX Gaming, OMI Gaming, PariPlay, Play'n GO, Playson, Quickspin, Red Rake Gaming, Spigo, Spinomenal, Vivo Gaming, World Match, and XPG. If you’re a slots fan, you’ll find new releases like Blood Suckers II, and Reactoonz, old favourites such as Starburst and Book of Dead, jackpot slots including Hall of Gods, and many more. Table and card games are covered too, with variations on your favourite games, and the Evolution Gaming Live Dealer suite offering some of the best Live Casino games around. Fantasino took a risk, it’s a competitive year for online casinos and this one came in with a complicated ambition, but it’s pulled it off and done so with style, earning thoroughly deserved critical acclaim while it does it!